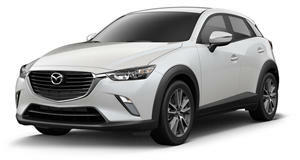 With only one engine and a 6-speed automatic transmission, Mazda CX-3 buyers are a little limited for choice. But they can take solace in knowing the 146hp 2.0-liter SKYACTIV-G is an exceptional performer with a fondness for fuel-savings, and has the option of AWD. Though a little cramped by segment standards, quality and design exceed that of its rivals. No special trim options are available, though the top Grand Touring trim gets 18-inch alloy wheels, LED headlights, and a power-sliding ‘moonroof’. Safety equipment options include radar cruise control, lane departure warning, and a blind spot monitor. The world seems to have an ever growing desire to move on up, not in stature, but in seating position. 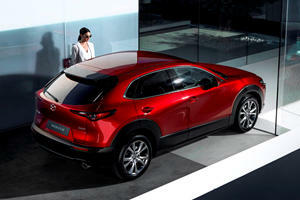 To this end, compact crossovers are fast becoming the norm, replacing their hatchback counterparts across the globe. The USA is no exception, where the 2nd generation Mazda2 is no longer an option. 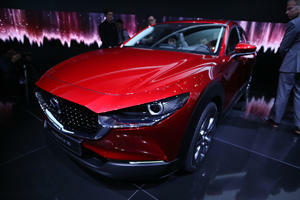 Instead, the Mazda CX-3 fills the void, but with a more rugged appearance and a lifted ride height. Against steady born-to-be-crossover models like the Nissan Juke and Fiat 500X, does the lifted sub-compact hatch offer anything unique? While brands like Kia and Hyundai have received much acclaim in recent years for their interior qualities, Mazda has surprisingly gone under the radar. The Mazda CX-3’s interior design feels more Audi than Mazda, with stunning aviation themed air vents and a BMW iDrive style infotainment system with a 7-inch touch screen. Materials are high quality and main touch points feel excellent – including the leather strip across the dash. There’s space for 5, and it’s easy to get comfortable up front with tilt and telescopic steering adjustment. But rear occupants suffer when it comes to spaciousness – the humble sub-compact hatchback origins betraying the outward appearance of spaciousness. Rear space is not only bested by almost all competitors, but even by other small Mazdas like the Mazda3. 60/40 split rear folding seats give the option of enhanced cargo capacity, upping it from 12.4 cubic feet to 44.5 cu ft.
Exemplary – truly benchmark in the segment is really the only way to describe the handling and ride of the Mazda CX-3. Despite lacking the ride height and wheel travel of rivals like the Fiat 500X, the suspension on the CX-3 soaks up just about every bump without fuss. The benefits of the hatchback origins become apparent when cornering, as the suspension remains taut and resistant to body roll. Body control is exceptional over all surfaces. The electronically assisted steering may be a bit cold as far as feeling goes, but there’s a sense of connection to the road through the chassis that translates into a sub-compact crossover that’s an absolute blast to drive hard and fast through flowing corners. The CX-3 strikes a fine balance between composure and fun that makes it feel youthful and enjoyable to drive. There’s only one engine for the CX-3. 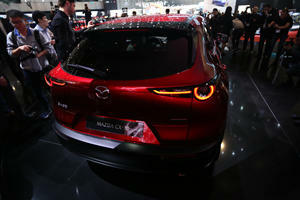 Thankfully the non-turbocharged 2.0-liter SKYACTIV-G gasoline engine is a good one. It outputs 146 horsepower and 146 lb-ft of torque, but because the torque only arrives at 2800rpm and peak power at 6000rpm, it needs to be wrung out to get it going; the engine revels in doing so though. The solo option 6-speed automatic can be slow in changing gears, but selects the right gears consistently. Drive can be sent to either the front- or all-wheels, with little impact on the EPA economy ratings. The CX-3 achieves 29/35mpg in FWD specification, 27/32mpg in AWD, better than any of its rivals. Cruise control, a rear-view camera, air-conditioning and Bluetooth connectivity are all standard equipment, with leather and heated seats only available on higher trim levels. As for safety, all models get ABS with EBD, as well as front and side impact airbags, along with rollover protection. Higher trim levels get blind-spot monitor and rear cross traffic alert, as well as the option of radar cruise control, smart city braking, and lane departure warning. The Mazda CX-3 is an IIHS Top Safety Pick+ and scored 5 stars in NHTSA tests.